I don't know what it is about Sweden. The country continues to crank out one brilliant retro/psych/doom rock/metal band after another, such as Witchcraft and Troubled Horse. 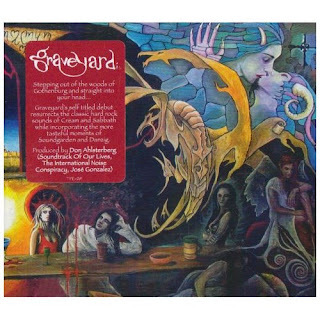 I just discovered another excellent Swedish band called Graveyard. Their music is exceptional...it's filled with your usual retro Pentagram, Blue Cheer, and Black Sabbath worship, but these guys add a modern, driving touch to their music as well. The vocal delivery is akin to a cross Glen Danzig, Ian Astbury of The Cult, and Jim Morrison. The music reminds of the heavy, starry eyed, retro rock of The Cult and also Glen Danzig's solo work at times. The guitar playing is fuzzed out, psychedelic, and euphoric, reminding me of the guitar work of Monster Magnet and space rock gods Hawkwind at times. Anyway, Graveyard has one self titled album that came out in 2008. I just purchased it this morning and comes highly recommended. Here's the first track, "Evil Ways". I'm sure you will enjoy.